Their pricing is a not transparent. Major Crash issue, someone help?? Hi, ive been using sampletank for months now. Ive invested alot of money into it you guys have awesome libraries that help me creatively take the next step and i couldn't be more thankful! Recently i updated my Iphone 7. And after the newest update, Sampletank automatically crashes whenever i try and adjust the “attack and release & inst volume & pan etc” knobs. Ive tried uninstalling it, changing instrument packs. Restarting my phone etc... and no solution. Ive sent 3 emails to your support team and its been a little over a week since i sent them and still have no reply. Please, i expect to buy new things on sampletank very very soon. But i just cant until i know that this solution can be fixed! Not water your money, on the demo version. Not waster your money, buying libraries in the demo version, because when you buy the full version you will have to buy it again. This company does not listen to you, and the button to restore purchases does not work. they force you to have the two versions installed, each version 1.6 gb, 3.2 GB. from your ipad. the app is good, but your business system is a steal. I write them and they only make excuses and do nothing. You have to register your info to get the manual. American Acoustic is a rip off! For me to come and do this I must be very disappointed. I paid $11.99 for American Acoustic. I was lured in by the beautiful, romantic Latin guitar that plays in the preview. Sorry but I don’t hear that in the guitars I received. None are of any use to me. I could’ve just stuck with the original ST guitars. All I have are a number of reedy, super thin, plucky sounding guitars appropriately called picks. Seems very much like false advertising. If you used these as a preview no one would buy. There’s nothing lush or rich or even acoustic sounding about these presets. Crashes I paid a lot of money and it crashes. Fix or refund! Audio Unit support is the standard I’m waiting for. Please update quickly , there is a problem when you are moving the layers in Livemode it crash and it closes by itself. Please fix these as soon as possible This problem appeared when I updated to iOS 12. Please fix this. Get the pack! User friendly! Finally a nice pro workstation for getting your groove on! A Blast! I have it installed. I have used it. Now it won't update as iTunes now thinks it is not compatible with my iPad 2. It worked fine before. What did you do to ruin the compatibility? That is a pretty brainless error. Won't update for older iPads. Get a message that the update is not compatible with my iPad! Worthless piece of junk! I just needed a few simple sounds to use with my guitar synthesizer. They offer a package that is supposed to include all instrument sounds. It doesn't. So far, I've purchased three libraries. I've spent $60 to get a few decent sounds. They include so much junk/loops/fluff. 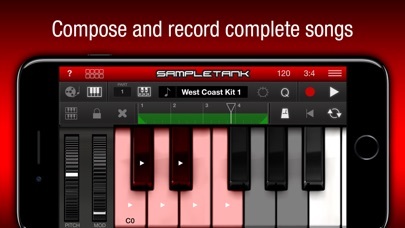 For the past several years, I have created music on the iPad with a variety of apps (GarageBand and SampleTank, mainly) using the camera connector kit to use a Yamaha USB midi cable to connect my keyboard to my iPad. The setup worked flawlessly until iOS 9. I understand there has been a change in the Core Midi interface of the OS, and I assume this is the culprit. My setup no longer works with either app. My husband's iPad is still running 8.4 - I downloaded GarageBand on that and low and behold, the cable works as intended. He needs his iPad for work, and I need mine for my work. I am a musician and a playwright, and my livelihood depends on these accesories working properly. Can someone please help me figure out how to make this work? Or Apple, will you please change core midi back?? Thank you. 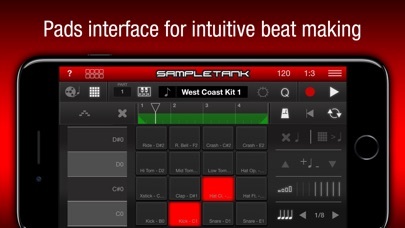 This is an awesome app if you play the drums... This is what your looking for!!!!!!!!!! 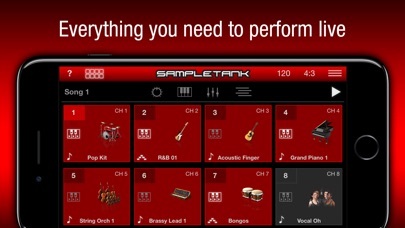 This app really thrives when partnered we the iRig keys or iRig keys pro. The voices aren't the highest quality but the settings and controls are easy to use. 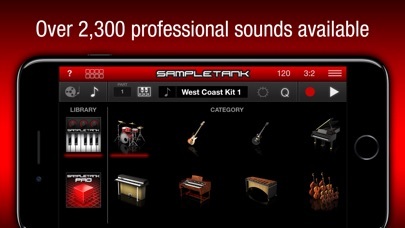 I love the fact that IK multimedia made it so you can use sample tank and iGrand piano from within GarageBand it takes garage band to a new level. The only thing I'm not a big fan of is the auto play tracks on the lowest key. Mostly because I play live a lot and if I accidentally hit the last key it's quite disturbing. But other than that I do love this software and would highly recommend this app as well as the iRigs pro they make a great team. My version no longer works! The product and upgrades I paid for no longer function with this upgrade! Not a good move to release a new version not keep the older version available. The solution is to buy a new iPad? I don't think so! Hate the latest update. Can't recover the sound library I paid for. Thanks for making this app totally useless for me now. The only reason I got this app was to use with my ipad and when trying to use this app through the inter app function, the timing is always off. And yes, my tempo and signatures are matched. It,s just off enough to sound horrible. Please fix this and I will give the rating it really deserves which is 5 stars. Will not update correctly on my iPad! The sounds are not bad. That said, the look of the app is tacky with it's red and black theme. But worst of all, the pop up advertisements that require user interaction are annoying, disruptive to musical inspiration or the work flow, and rather rude. After paying for so many of the in-app purchase options, and spending so much on IK Multimedia hardware, one expects to not be hounded. Why don't you grab me by the ankles and shake the money out of my pockets? BAD FORM! Thank you for making it compatible again! Cool app. But only when it works. Its not working right now in this update. As soon as you touch any of the adjustment knobs, the app crashes. So its almost useless right now. I’m using iPad Pro 2. Love the Miroslav Philharmonik sounds. You should consider that everybody is working on an IpadAir2 ..... My IPad suddenly took it upon itself to update itself with no approval from me and now the version you updated for newer IPads does not work for me..I am missing purchased instruments and volume is non existent and keyboards do not change from maxi to mini... I paid good money for this formally great app and should be able to continue to use it despite your improvements otherwise you have stolen my money You should make good by at least having the older version still available ....Please place that up on your website and notify us lowly older iPad users so we who have no funds for a newer iPad should not be prevented from using your app. I'll bet the real version is much better, but I can't tell by playing with this piece of garbage. They have to give people something they can enjoy or else it just wastes time and leaves you annoyed. 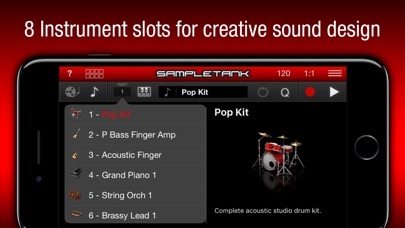 After all the years I've been involved in song writing, everything was made easy with SampleTank 2 plus made my go to app an obvious choice. Anxiously the release iRig Mini reference monitors. I feel it is going to be worth the wait. I am now unable to restore my in app purchases. This has made the app useless to me. Either needs fixing or a refund for in-app purchasing of the different sound packs. From not so hot to worse. The folks at ST think that ipad users are not worth update compatibility have blundered big time. Cheesy sounds too. I love this App cuz I played it on my iPad but now I just have an iPod and now it won't download. Can y'all plz set it up for iPods too? I used to use this application every day with my midi controller. After the update, I can't even install it on my iPad fourth generation. I have already purchased the instruments for this app. Now I can't use the app or the instruments. I demand my money back!!! Questionable quality. Crushes too often! The app has a very good potential. I bought almost all upgrades spending over $100 and it has lots of instruments and loops. I like it, but there are two problems. First, it crashes too often, especially when you switch instruments. Second, I am not sure in the sound quality. By my ear it does not sounds as good as Garageband and some other music apps I own. So it is ok , but not very good. Need lots of improvement. The good thing is that it has now MIDI export, so I can import loops into Logic. I'm a musician who has been looking for an app where I can record my music on the go. Garageband is amazing for that, I can even hook up my guitar and record! But what Garageband didn't have was good keyboard/synth effects. So I downloaded the free Sampletank app and was amazed at what they had to offer. I can record right in the mobile garageband with my irig keyboard. So I bought the full version along with the packs and now I'm limitless! I can do my Symphonic Metal songs and my Electro Industrial songs wherever I go! Love it!!! This an awesome app but it needs a fix ASAP!!!! It needs iOS8 support, Audiobus has been disabled. This app does not allow me to change the tuning of the instruments. Some of us don't want to be forced into the world standard of A=440hz. Please update this so that we can adjust it to whatever we want. I used to love writing in MIDI and MOD and this let's me play around again using good-sounding instruments. Plus, what they give you will give you lots of fun and when you've done it all there's even more to come.